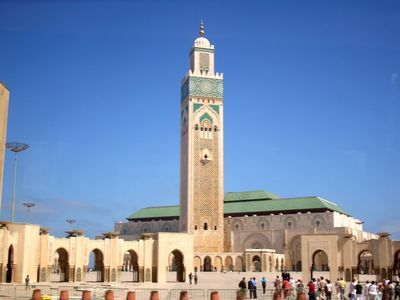 King Hassan II Mosque, completed 1993, Casablanca -- Photograph 2008 Via Wikimedia Commons. Joseph Braude, who also writes for The Huffington Post, is the American scion of a distinguished Iraqi Jewish family. His mother emigrated to Israel, but the family landed in Providence, R.I., where Braude grew up. His mother then divorced, and in her company, Braude began to study Arabic language and Islamic culture. In 2008 he was permitted to spend four months embedded with a unit of Morocco's Judiciary Police in the country's commercial capital, Casablanca. The result of that experience is described in an encyclopedic examination of bloodshed, punishment, radical Islam, Jewish minority life, sorcery, corruption, individual rights and governmental opacity in northwest Africa's largest city. This true-crime chronicle is titled The Honored Dead: A Story of Friendship, Murder and the Search for Truth in the Arab World. Braude went to Iraq after the U.S.-led intervention in 2003 and published a volume on that country's then-unknown potential for democratic governance, The New Iraq (which I reviewed). His facility with the Arabic language, supplemented by Persian, as well as his religious education in Hebrew, have enabled him to travel widely in Muslim lands. He clearly has a warm and perceptive empathy for Arab Muslims and a wide understanding of their difficulties. The Honored Dead relates, with the quirky pace of a post-modern detective story, Braude's dedicated investigation of the murder of the poor and obscure Casablanca denizen Ibrahim Dey, by a Moroccan soldier, Al-Raddad Murtaziq. Dey, a night-time squatter in the warehouse of a Moroccan Jewish businessman, had been beaten to death with a stick. That aspect of the case appears in no way mysterious. But the motives of the killer and the methods of the Moroccan Judiciary Police include numerous enigmas, which Braude has untwisted and examined. The narrative in The Honored Dead is convoluted, as Braude proceeds from one element of the crime to the next. He cultivated a certain Muhammad Bari, who was the best friend of the murder victim. Together, they travelled through the impoverished slums of the Moroccan metropolis to interview Dey's immediate family, from which he was estranged. They went by train to Jadida, a coastal city with a majority composed of Berbers, or Amazigh -- their preferred ethnic name -- to meet his more distant, but equally ambivalent relatives. Dey was Amazigh, only 47 years old, but is portrayed as prematurely aged and broken. He supported himself by petty deals, presenting himself, like many other poor folk in Casablanca, as a "property agent." He had been allowed to sleep in the warehouse by another man, who was supposed to be the regular night watchman, and who was fired when his dereliction of duty was exposed by Dey's death. Almost immediately, a reader suspects that the Moroccan authorities with whom he has been embedded are toying with Braude as he seeks to penetrate the circumstances of Dey's killing. He is told that Murtaziq, the perpetrator, has confessed, and is provided with a copy of an official report on the crime. But he learns from one of the policemen with whom he is embedded that the document has been redacted to protect the state security services. Murtaziq's relationship with the police, while serving in the army, is unclear to Braude. According to the "official story" provided by the investigators with whom he has developed a partnership, Murtaziq got drunk, ran into a gang of street kids, and climbed over the wall of the warehouse to escape them. He was challenged by Dey, who poked him with the stick. He took the weapon away from Dey and killed him, then stole two coats and a small sum of money from him. Murtaziq, who had been cut and bled at some point, checked into a hospital under a false name, claiming to be an illiterate construction worker. But he was soon identified as the killer by DNA testing -- somewhat surprising to find applied in an Arab country. Braude learns that Murtaziq has given differing versions of his encounter with Dey to his mother, who is allowed to visit Murtaziq in jail once each week. In one account, he was drunk, climbed into the warehouse to sleep, and got into a homicidal fight with Dey. In a variant tale, Murtaziq was drugged by someone in the army and given instructions he does not remember. On a third occasion, Murtaziq told his mother he killed Dey for a reason, but that he will not disclose it until his trial. The trial of Murtaziq is missing from the book, as is a followup on the handling of the case. Braude for some time suspects that Dey might have been an Islamist militant, done to death by Murtaziq as part of the Moroccan government's program of curbing radical Islam -- especially the Wahhabi variety imported from Saudi Arabia, which motivates Al-Qaida. He also suspects that the warehouse was associated with drug trafficking and other lawbreaking. As he and Muhammad Bari proceed from shantytown to village, and from one branch to another of the Dey extended family, they are offered further, distinctly different hints about the crime. They also visit the father of Murtaziq, in Ayn Tizgha, a village on the outskirts of Bin Sulayman, an agricultural region an hour from Casablanca. Dey was, they are told, cursed by a woman who interfered in his relationship with a cousin, with whom he had operated a store in Jadida. With the mention of a curse, the tale grows increasingly esoteric. Dey had recounted a dream to Muhammad Bari, and Braude consulted a psychologist back in the U.S. to attempt an interpretation of it. Dey, Braude eventually realizes, has read Arabic classical literature on dreams. An important stream winding its way through this book concerns the Moroccan Jewish owner of the warehouse in which Dey was killed, Marcel Toledano. The Honored Dead includes a valuable portrayal of the communal life of 3,000 Jews who have remained in Morocco, where they are protected by the government of King Mohammed VI, as the king's grandfather Mohammed V refused to hand over the Moroccan Jews -- then numbering almost 100 times more -- to the Germans during the second world war. Braude theorizes that perhaps Dey was killed to harm the Jewish merchant. But that trail proves unhelpful -- except that Toledano tells Braude that Dey was a "fqih," or magician. That, too, could have been the cause of his death, since Arab Islamists are obsessed with eliminating alleged witchcraft. Finally, the explanation accepted by Braude for the brutal slaying of a nearly-anonymous Moroccan has only secondarily to do with radical Islam and with necromancy. Braude learns that Dey had listened to sermons by a radical Egyptian cleric. He finds among Dey's possessions a collection of the magical accessories, including the dried brain of a hyena, that a fqih would employ. Still, the death of Ibrahim Dey, according to Joseph Braude, becomes almost banal once the American is allowed access to medical examiners. To reveal the cause of Dey's gory end as reconstructed by Braude would, obviously, spoil the pleasure of this volume for true-crime readers. Suffice to say that in examining the demise of an impoverished and unknown Moroccan man, Joseph Braude has dissected and analyzed brilliantly the caste, cultural and class contradictions in Moroccan society.